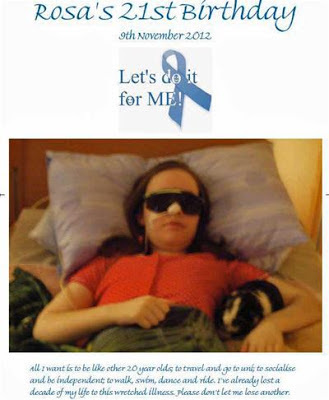 Rosalind Amor has been an enthusiastic supporter of the Let's do it for ME campaign since its launch in the summer of 2011, as one of the first members of the online planning group and also of the Make ME Crafts team, as in spite of severe illness, Rosa crochets soft wool blue awareness wristbands when able to for Invest in ME. We wrote about Rosa's Wristbands in March 2012 and she raised over £100 for ME Awareness Month in May but by July her hands had become too weak to crochet. Following a decline in health, Rosa spent most of August and September in hospital, transferring to a Nursing Home where she is being fed by a naso-jejunum tube. Rosa turned 21 on 9th November and, in her usual inimitable fashion, she had a very clear idea as to how she wanted to mark this significant birthday. 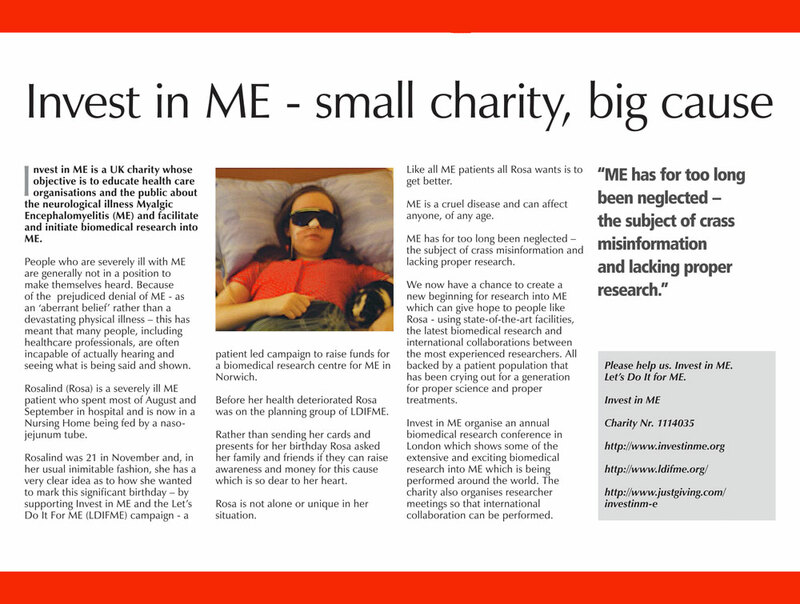 She planned to use her 21st as an appeal for our campaign to raise funds for biomedical ME research at the centre of excellence in Norwich proposed by Invest in ME. Rather than sending her cards and presents, Rosa asked her family and friends if they would raise awareness and money for the cause which is so dear to her heart. She had said in July, “I so wish we could get this centre running, I need it!" "We would like to thank Rosa for her recent appeal and Julia for agreeing to let us use Rosa's story to raise awareness. We wish to thank all of those making huge efforts to support us and enable biomedical research into ME and thereby increasing awareness of ME. As we have seen from recent news in Norway (no public funding granted for a Phase III trial of the promising drug Rituximab in ME patients) we, the patients and carers, will have to take control of this state of affairs and make research happen. We are nearing our target to initiate our first project. We will continue to progress and facilitate collaborations between researchers. With other members of the European ME Alliance we will work together to make ME a properly researched and treated disease. Let's Do It For ME." Sending our love and every good wish to Rosa for her 21st birthday from the team at Let's do it for ME! 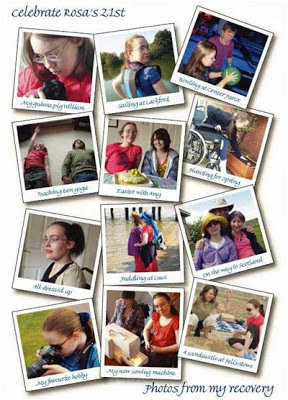 (click here for Rosa's 21st Birthday Appeal in pdf). 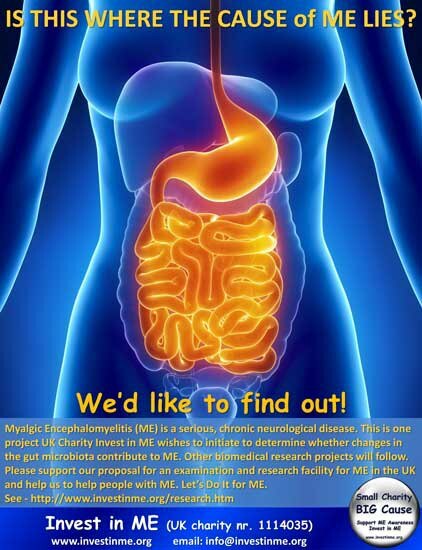 Let's do it for ME is a patient driven campaign in support of Invest in ME's proposal to establish the first UK centre of excellence dedicated to translational biomedical ME research and patient care. All funds raised are for the research. Please see our main website for full information and to see how you may become involved in helping to frame a future for proper recognition and treatment of this disease.